If you are heading out into the wilderness, then you will need to sift through the dutch oven pots so that you can pick out a top notch one to cook in. Dutch ovens are as close to cooking as they did in colonial times as you will get today. Adapting most any recipe for use in the Dutch oven is simple except for maybe grilling. Dutch ovens are perfect for cooking all your meals, and they are helpful in the home kitchen as well. Take a look at the pots available below. What Kind of Dutch Oven Available? There are quite a few to pick from so do read through the features of each one to see which is more convenient. They are pretty similar, but they vary in sizes from 2 quarts up to 8 quarts. Whether you are backpacking on a family vacation or having some camping fun, you can always take your handy Dutch oven along to cook your meals with ease. Wake up from your tent to a tasty breakfast you can make yourself! Get ready to go camping! It has been built with the trademark feet on the bottom especially for camping. You will find that it comes with a hand lid that is also reversible for your ease of use and a useful wire handle with a stay cool capability. 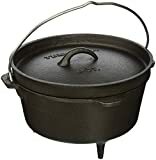 You can use it to hang this pot over the fire and cook your meals easily. 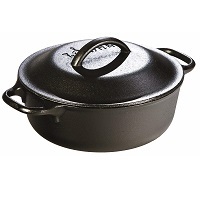 This is a traditional piece of cast iron cookware that is already pre-seasoned for you! 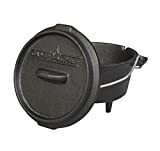 This is The Camp Chef Lewis & Clark Dutch oven for camping.It will hold up to 12 quarts and is made of seasoned cast iron.There is a handy deep dish lid that can also double as a skillet or serve trivet. The lid is also constructed to help increase air flow for thorough cooking. A great feature with this item is that it comes with a beneficial thermometer channel which allows you to check the internal temperature without lifting the lid! 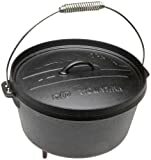 This is a smaller sized Dutch oven that holds up to 2 quarts. It is equipped with an iron lid for even cooking and temp. Control and is handy for slow cooking meals. It has already been pre-seasoned with vegetable oil and is ready for use. The iron lid can conveniently be inverted to be used as a skillet/griddle, perfect for flapjacks! It measures 8 inches in diameter and is approximately 3 inches deep. 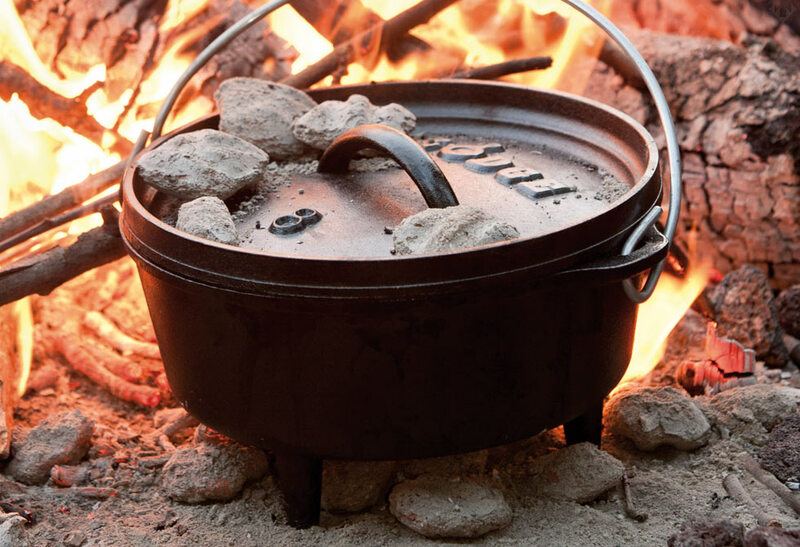 The Lodge Logic Dutch oven is just right for camp side and campfire cooking. It has been built from a durable cast iron to make sure your heat stays in and to ensure proper distribution. It comes with a convenient thin wire handle to easily remove the pot from the fire or heat. It has 3 legs so you can sit it among coals in your fire. You can also use the lid as a skillet which will make it easy to cook other items besides stews. This pot has also been pre-seasoned to make your cooking less likely to stick, but it is recommended to spray with oil for the best results lightly. Here is a larger sized pot called the Old Mountain Pre Seasoned. 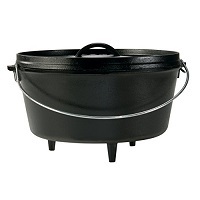 This Dutch oven will hold up to 8 quarts which are great if you have more people in your party to cook for. 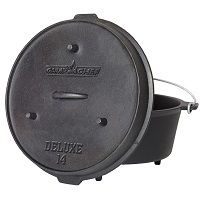 It comes with a convenient and sturdy flanged lid for even cooking over a campfire. This pot has already been pre-seasoned for easy use and no stick cooking. It will heat slowly and evenly. It also is equipped with a spiral ball handle to lift quickly. But with a smack great and a bit of ingenuity, this too can be accomplished. This is the best way to get away from the fatty foods we have come to rely on in our diets. These ovens were a way to make the most of the limited supplies that our ancestors had on hand. A good hearty stew could feed a large family with only a little meat. The thing is that not too many of these are around today. Sure you will find plenty of items that are being labeled “Dutch Ovens” but to do justice to your meal you need the real deal. It has to be made of cast iron for one thing. It has superior heat retention and an even surface temperature. Grandma used a cast iron skillet for the best-fried chicken in town and cornbread that was to die for. 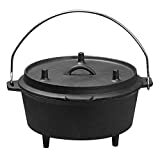 When you cook in an authentic Dutch Oven, you begin to understand that there may be more technologically advanced metals but they can’t stand up to the consistency of the cast iron Dutch Oven. The real McCoy has three stubby legs and a hanging handle. Now they are heavy, but they are also a very brittle iron. Dropping it could be a disaster for you. If you are on a camping excursion, it could leave you with no way to eat. Properly treated cast iron is one of the best non-stick surfaces ever. With the development of Teflon, a lot of today’s cooks have been cheated. They have been forced to cook on what we feel are inferior surfaces. Thank goodness there are a few artisans around that still make a quality Dutch oven. When you buy one, you have to clean it thoroughly with a good detergent to remove any of the anti-rusting chemical residues. Next, you have to season or sweeten the cooking surface. This is simply coating the surface with oil and baking it to 300 degrees or more. It takes about 4-5 hours to get a good season on the surface. Did you ever wonder why the best hamburgers were made at the greasy spoon or truck stop diners? Most of them had grills with cast iron surfaces. These like the Dutch oven retain a portion of the flavorings of things cooked before and each new dish is enhanced by the amalgamation of flavors. When camping outdoors designing the fire to use is the main concern. You have to make sure the fire will produce a slow and even heat. Hot spots will burn the contents of the Dutch oven in some places and undercook others. You have to preheat the oven long enough for to reach a good cooking temperature. Some people have found that placing coals on the lid of the oven will help it to cook more evenly. The best way to use a Dutch oven is to keep it from direct contact with the coals. The original design has the legs for just this purpose. Some recipes are even better served by making a small tripod and suspending the oven over the coals. Pit baking is an art, and the Dutch oven readily lends itself to this form of baking. One of the best ways to do this is by digging a pit that will hold the oven and a lining of rocks. Line the hole with the rocks and get a good fire going inside it let the stones become red hot. After the fire has burned out place the oven inside cover with rocks then build a nice sized fire over top of the pit. The rocks will conduct the heat down to the oven and bake the contents inside. As you can see Camp Dutch oven cooking can be fun and versatile. It is one thing to be the camp cook it is another to do it with style and flair. If you are the type, who likes the authentic rustic experience of true camping you can find no better way to accomplish this than cooking your meals in a Dutch oven.